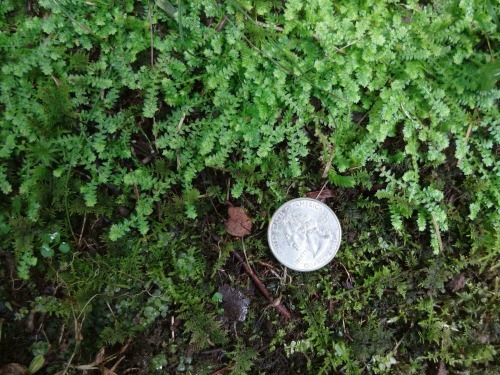 While I was writing about ferns and mosses, I became aware of other plants that could not be ignored, since some are very common here, such as Ground-pine and Running-cedar. These plants are Lycophytes, which happen to be the first entry of Taxonomic Treatments in the Flora of Virginia, on page 137. Lycophytes are followed by the Pteriodophytes, then the Gymnosperms and last, Angiosperms. So I had to learn about quillworts and clubmosses and spikemosses; and I included them in my new book, Ferns and Mosses of Virginia’s Coastal Plain. The real problem is the names, both common and scientific, because the plants are quite different. Ground-pine is also known as Tree-clubmoss because it looks like a little pine tree, and the yellow cylindrical cones appear on the tips of upper branches to release tiny spores. The current scientific name is Dendrolycopodium obscurum (formerly Lycopodium obscurum), so that is reasonable. But Running-cedar, formerly Lycopodium digitatum is now Diphasiastrum digitatum, which I find impossible to remember. The plant does apparently “run,” from its creeping stems; and separate branches carry forked shoots with spore-bearing cones at the ends. 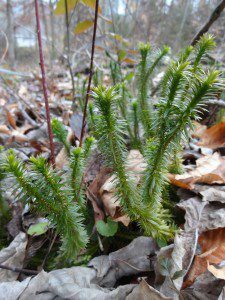 Further confusion comes from the fact that Ground-pine is also called fan clubmoss, ground cedar, crowsfoot, running ground cedar, running pine. And Running-cedar is also known as prince’s pine, princess pine, flat-branched Tree Clubmoss. Tree-clubmoss and Running-cedar are the names that accurately convey the appearance of these two plants. The bog clubmosses look like mosses with clubs, and they grow only in wet areas, bogs, swales and seeps. Two species are common in the Coastal Plain, but are seen only walks that venture through swamps and marshes that comprise their habitat. 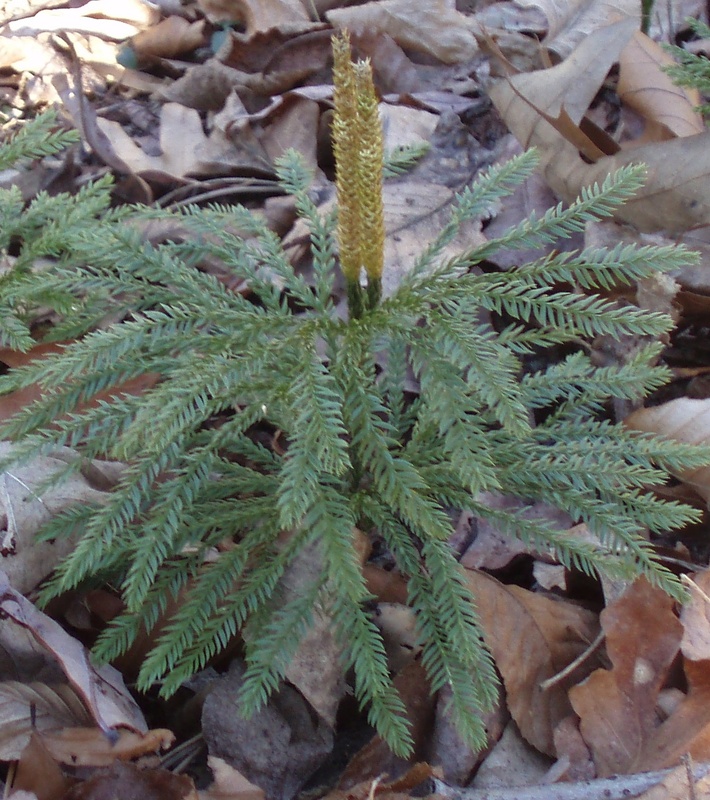 These plants had been classified with Tree-clubmoss and Running-cedar, but on the basis of molecular evidence, have been reclassified in the genus Lycopodiella. Southern Bog Clubmoss is now known as Lycopodiella appressa; and Foxtail Clubmoss is Lycopodiella alopecuroides. Shining Clubmoss is another plant formerly in the genus Lycopodium; once Lycopodium luciculum, but now Huperzia lucidula. Shining Clubmoss grows in moist pine woods and along stream banks. A cluster of these plants can be identified by erect stems with a bristly appearance due to many small evergreen leaves. Less than 12 inches tall, the leaves are shiny and dark green, and winter buds may form at constrictions along the stems. The Flora separates plants in the genus Huperzia from all others since the stems are erect and usually unbranched. Other species are prostrate or erect and branched. Meadow Spikemoss, (Lycopodioides apodum/Selaginella apoda), is one of 300 species that have changed little in the last 300 million years. Most Selaginellas grow in the topics, but some are frost and drought tolerant. Meadow Spikemoss is frequent in Virginia, but often overlooked, growing in shady wet places, often alongside mosses on stream banks and in swamps. The plant can be mistaken for some large mosses, but it has a true stem that carries water and nutrients. It grows in loose mats of long threadlike stems without much branching. It has four rows of tiny yellow-green leaves, pointed and with a prominent vein. Other species and cultivars of Selaginella are available in many garden centers as container house plants or as groundcovers in woodland gardens near hosta and other broad-leaved perennials. The least well-known Lycophyte in our area is an unusual perennial, Engelmann’s quillwort, with hollow-quill-like leaves, always submerged in streams, ponds, wet roadside ditches. Superficially quillworts look like clumps of grass emerging from muddy waters. But the stems are hollow, and the plant is anchored to an underground stem that absorbs nutrients. Photographs and more comments about these interesting plants are in “Ferns & Mosses of Virginia’s Coastal Plain,” available from the author. Contact me at helen48@cox.net.